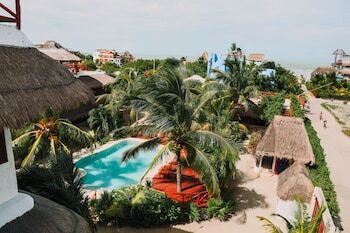 With a stay at Ensueño Holbox Apartments in Isla Holbox, you'll be near the beach, just a 1-minute walk from Holbox Beach and 11 minutes by foot from Passion Island. Featured amenities include dry cleaning/laundry services and a 24-hour front desk. A roundtrip airport shuttle is provided for a surcharge (available 24 hours), and free self parking is available onsite. A stay at El Chante Spa Hotel places you in the heart of Jocotepec, a 1-minute drive from Lake Chapala and 7 minutes from Sierra De San Juan Cosala. Free valet parking is available onsite.